Floyd Starr, affectionately known as "Uncle Floyd," founded Starr Commonwealth as a refuge for "homeless, dependent, neglected and wayward boys." His idea for a commonwealth came to him as a young boy when he was growing up in Albion, Michigan. One evening, he overheard a conversation about a man who had adopted many young children. The next day, Floyd asked his mother what adoption was. She told him that it meant taking children who don't have a home, providing for them, and giving them a permanent home with good families. Floyd was so impressed, he told his mother that when he grew up he was going to buy a farm and adopt 50 children. As a young man, Floyd studied at Albion College, and upon graduating, was employed for a brief time at the Bernard McFadden's Hollywoodite in Chicago. He then went to work at the Beulah Home for Boys. When the facility closed, Floyd, the assistant Director at the time, was able to find new homes for all but 13 boys at the facility. It was then that his dream started to become a reality. He purchased a 40-acre farm outside Albion, Michigan and set to work making a home for these troubled boys. The forty acres that Starr purchased in 1913 included a barn where he stayed with the first two boys, Harold Belloir and Thaddeus Newcomb, until Gladsome Cottage was built. Founder's Day, which is observed the first Sunday of every October, marks the anniversary of Floyd, his family and thirteen boys moving into Gladsome Cottage on October 3, 1913. By 1915, enough boys were coming to Starr Commonwealth that Gladsome Cottage was no longer large enough to house them all. That year, Newton Hall was built as a dormitory for the boys and in 1917 the boys had a new school, the Emily Jewel Clark Building. Just 5 years after he began Starr Commonwealth, more than 200 boys had a home to stay with "Uncle Floyd", as the boys affectionately called him. Additional facilities were added during the 1920s as well as the '50s and '60s. The campus now totals nearly 30 buildings. 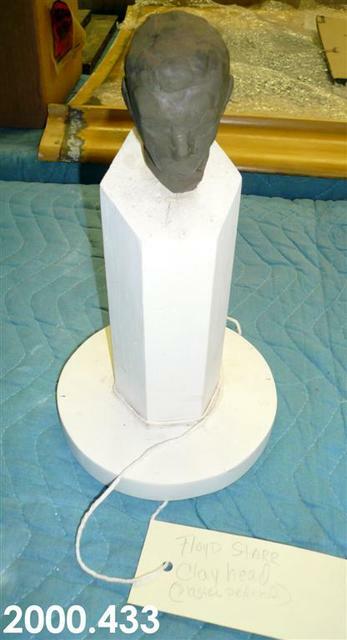 Clay head: 3.75" x 2.25"
Fredericks, Marshall M., 1908-1998, “Floyd Starr, [Clay, Plaster and Wood],” Marshall M. Fredericks Sculpture Museum, accessed April 22, 2019, http://omeka.svsu.edu/items/show/6631.